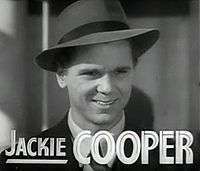 John Cooper, Jr. (September 15, 1922 – May 3, 2011), known as Jackie Cooper, was an American actor, television director, producer and executive. He was a child actor who managed to make the transition to an adult career. Cooper was the first child actor to receive an Academy Award nomination. At age nine, he was also the youngest performer to have been nominated for an Academy Award for Best Actor in a Leading Role—an honor that he received for the film Skippy (1931). For nearly 50 years, Cooper remained the youngest Oscar nominee in any category, until he was surpassed by Justin Henry's nomination, at age eight, in the Supporting Actor category for Kramer vs. Kramer (1979). Cooper was born John Cooper, Jr. in Los Angeles, California. Cooper's father, John Cooper, left the family when Jackie was only two years old. His mother, Mabel Leonard Bigelow (née Polito), was a stage pianist. Cooper's maternal uncle, Jack Leonard, was a screenwriter, and his maternal aunt, Julie Leonard, was an actress married to director Norman Taurog. His stepfather was C.J. Bigelow, a studio production manager. His mother was Italian American (her family's surname was changed from "Polito" to "Leonard"); Cooper was told by his family that his father was Jewish (the two never reunited after he left the family). Cooper left Columbia in 1969 and started yet another phase of his career, one in which he would act occasionally in key character roles. In the fourth season of Hawaii Five-O, he appeared as a doctor who murders his wife and bribes an innocent but terminally ill man to take the rap in The Burning Ice. He also appeared in Candidate for Crime starring Peter Falk as Columbo in 1973 and the short-lived 1975 ABC series Mobile One, a Jack Webb/Mark VII Limited production. He starred in a 1978 in two consecutive episodes of The Rockford Files: The House on Willis Avenue. He devoted more and more of his time to directing dozens of episodic TV and other projects. His work as director on episodes of M*A*S*H and The White Shadow earned him Emmy awards. Cooper's autobiography, Please Don't Shoot My Dog, was published in 1982. The title refers to an incident during the filming of Skippy. Norman Taurog, while directing Jackie Cooper in a crying scene, ordered a security guard to take away his dog and pretend to shoot him backstage. This resulted in genuine tears; however, even after Cooper found out that his dog was fine, he was left with ill feelings towards his uncle. Cooper has a star on the Hollywood Walk of Fame, at 1501 Vine Street. Cooper died on May 3, 2011 after a short illness, in Santa Monica, California. He was survived by sons from his first and third marriages. He outlived both daughters from the third marriage and his third wife, Barbara Rae Kraus. He was interred at Arlington National Cemetery in Arlington, Virginia, in honor of his naval service. ↑ Sharon Knolle. "Former Child Star Jackie Cooper Dies at Age 88". Moviefone. ↑ "Jackie Cooper". The Telegraph. May 5, 2011. Retrieved October 2, 2013. ↑ California Birth Index, 1905–1995. Center for Health Statistics, California Department of Health Services, Sacramento, California; accessed January 22, 2015. 1 2 3 McFadden, Robert (May 4, 2011). "Jackie Cooper, Film and Television Actor, Dies at 88". The New York Times. Retrieved May 5, 2011. 1 2 3 4 5 6 Cooper, Jackie (1982). Please Don't Shoot My Dog. Penguin Group. pp. 9, 32, 40–42, 44, 54–61. ISBN 0-425-05306-7. ↑ Harmetz, Aljean (1983). Rolling Breaks and Other Movie Business. Knopf. p. 108. ISBN 978-0394528861. 1 2 3 Matus, Victorino (November 22, 2011). 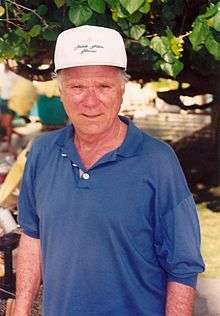 "Jackie Cooper, USN". The Weekly Standard. Retrieved October 2, 2013. 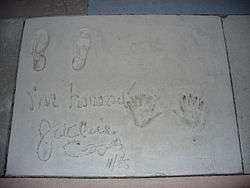 ↑ 6 Facts About Jackie Cooper, The Hollywood Reporter, May 5, 2011; accessed May 5, 2011. ↑ Mankiewicz, Tom; Crane, Robert (May 14, 2012). My Life as a Mankiewicz: An Insider's Journey through Hollywood. University Press of Kentucky. p. 198. ISBN 978-0-8131-4057-5. Retrieved October 2, 2013. ↑ "Lists honorary race officials". Gadsden Times (Alabama). April 26, 1976. p. 11. Retrieved December 20, 2011. ↑ McLellan, Dennis (May 5, 2011). "Jackie Cooper dies at 88; child star in the 1930s". Los Angeles Times. Retrieved May 4, 2011. Dye, David. Child and Youth Actors: Filmography of Their Entire Careers, 1914-1985. Jefferson, NC: McFarland & Co., 1988, pp. 40-43.